Why is this moon red? 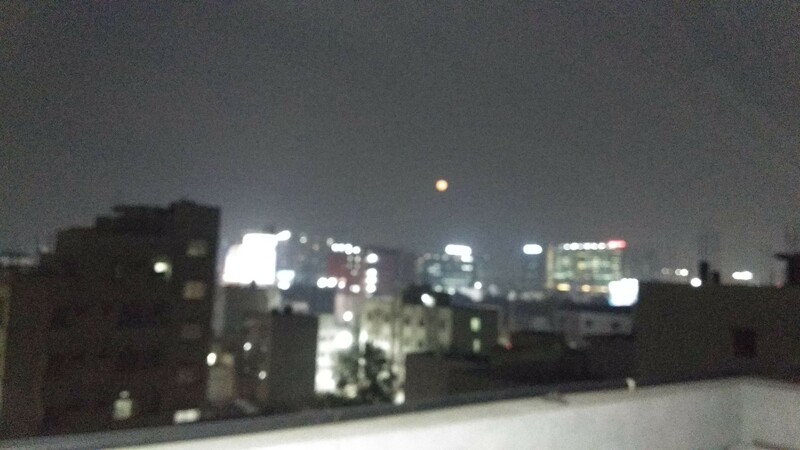 I wish I could attach a good quality photograph of this red color moon I'm looking at right now. 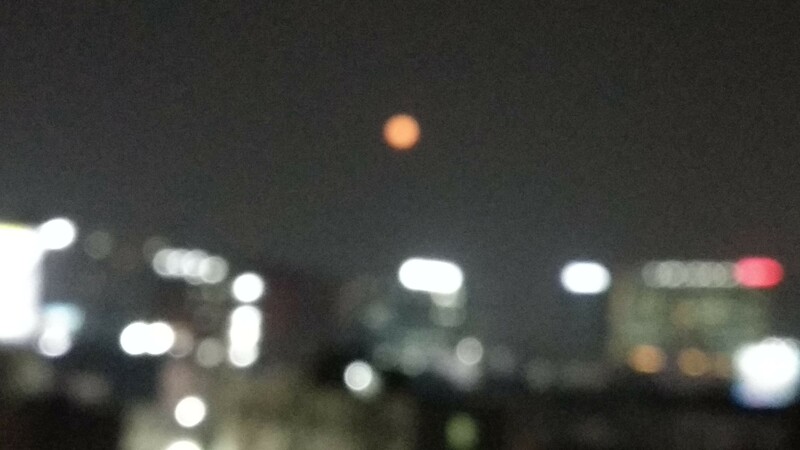 in HYDERABAD, INDIAN SUBCONTINENT around 7:20pm Please tell me why the moon is red tonight:) ? First of all there could not be an eclipse on December 23rd because that is one day later than the full moon. It is near the horizon, and being viewed through the atmosphere over a large city. Air pollution (for example from cars, trucks, fires etc) push small sooty particles in to the air. These particles scatter blue light more than red, so there is less blue light coming towards you directly from the moon. Sometimes sand from deserts can get blown up into the atmosphere, and it can get carried a long way. The sand has a similar effect to the soot. @Human Interesting question. I am editing my answer to remove the old post that may be misleading for new readers. @Human, @uhoh makes good points. Moonrise was 6:34pm on December 23th in Hyderabad. Azimuth 70.5 degrees (i.e. approx ENE), and altitude approx 9.2 degrees above the horizon. Therefore the moon was likely too far due north from the Krakatoa volcanic plume to be a reddening factor. The reddish moon in the picture that @Human posted is likely due to the effect of the thick atmospheric layer that the moon's light had to travel through at that low angle, over the city of Hyderabad - I don't know much about the condition of air pollution/dust in that area, but @Wayfaring Stranger noted that air pollution was high on Monday 24th Dec. Thank you @uhoh for your helpful comments. Judging color from snapshots can be a little tricky sometimes but I'm sure in this case the moon was quite reddened by atmospheric effects (normal Rayleigh scattering plus pollution, both natural and artificial). Reddening of the Moon is no different than reddening of the Sun. We may not notice it happening to the Sun until it becomes extreme near the horizon because the same sunlight is also illuminating everything else around us which re-adjusts our internal "white balance" mechanisms. The Moon isn't actually white or gray in color, it's a bit orange in reality. Here's a plot of the Moon's spectral albedo; it's average reflectivity as a function of wavelength. Our visual sensitivity is strongly peaked in the middle (yellow/green) so the linear slope has less of an impact than we'd expect, but it's still there! (most of the rest is borrowed from Why doesn't a full/gibbous moon high in the sky ever seem to look orange? Shouldn't it? above: "Figure 8: Averaged geometrical moon albedos measured by GOME from July 1995, November 1995, and September 1996." From ESA's GOME moon measurements, including instrument characterisation and moon albedo. 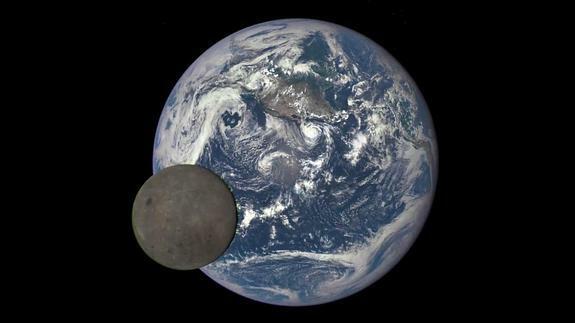 above: "Moon photobombs Earth" photo from DSCOVR, widely circulated NASA public domain image, from Why does the Moon appear gray when passing between the Sun and the Earth? If I isolate the moon with Python and calculate the average pixel values in the R, G, and B channels, I get [0.33, 0.31, 0,28] which is a pretty good match to the albedo plot if I just look at the plot around 450, 550, and 650nm, (which is what normal people do after spending hours trying and failing to understand the intricacies of human color perception). Particulate air pollution was quite high in Hyderabad on Monday. 181 particulate Monday vs the usual 98. The link doesn't seem to say what the units are, but it does say it's all particulate, and that it is "excessive pollution". Note that the contents of this link probably change on a daily or hourly basis. Is this the time of year when the rice farmers burn the stubble in their fields? If so, it's probably smoke making the moon so red. 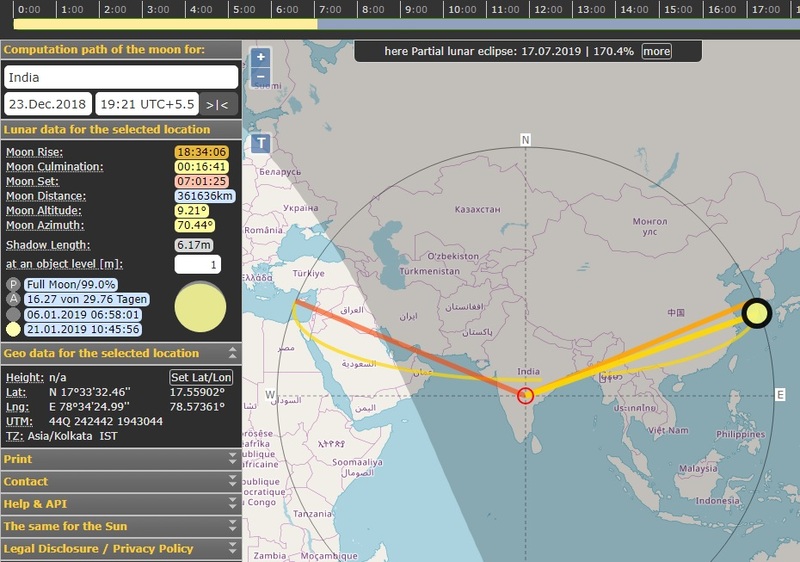 During a total lunar eclipse, Earth completely blocks direct sunlight from reaching the Moon. The only light reflected from the lunar surface has been refracted by Earth's atmosphere. This light appears reddish for the same reason that a sunset or sunrise does: the Rayleigh scattering of bluer light. Not the answer you're looking for? Browse other questions tagged the-moon or ask your own question. Can the moon turn red even without an eclipse? Is this photocomposition of Andromeda's galaxy and the Moon accurate? Is there really a blood wolf moon this month?